Days of space-consuming desks will soon be numbered if you know how to make a DIY wall-mounted desk with a hidden compartment and a handy pull-out drawer. This also means saying goodbye to the clutter on desktops. DIY Creators on YouTube shared a cool video showing how you can put together a practical space-saving desk that can be fixed onto a wall. Not only that, it also contains a pull-out drawer to keep all your stuff inside safely without any mess. Moreover, you can use the hidden compartment to keep your personal belongings that you don’t require very often. This small desk would be great for small offices or people living in limited space apartments. 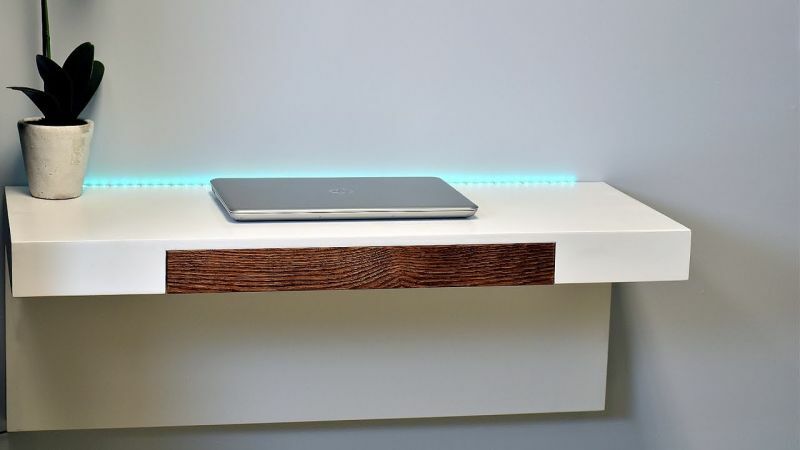 The wall-mounted desk also includes an array of LEDs on the back to keep the work area lit up. The storage drawer has enough space to keep all your work-related stuff inside. You can keep your writing instruments, notepads, as well as files inside it and keep the desktop clutter-free, every time you’re done with your work. Check out the video to have a closer look at this cool DIY wall-mounted desk.